Content Will Always Be King: There will always be a need for great content. When your visitors land on your website, your local marketing directory page, your Facebook or Twitter profile, or one of your posts on a popular online forum, those visitors should feel as though they are coming away with something valuable or useful. Whether you are providing tips and tricks, downloadable content, videos or photos, or a combination of all of the above, make sure your visitors are always educated and entertained. Don’t skimp on copywriting, video production, photography or any other type of content you include to gain an online presence. If you must outsource, so be it. You should do everything in your power to make sure your Internet marketing content is always top-notch and light years ahead of all of competitors. Accurate Use Of Colors And Graphics: Expert Internet marketers know that colors and graphics are equally as important as content when it comes to providing the very best online visitation experience. People aren’t as concerned with graphics as they are with content when they land on your page. So great content will always be your number one focus, but your colors and graphics should add to the complete experience and should go beautifully with your content and the rest of your online marketing materials. In other words, don’t go heavy on the graphics but include them just enough to complete the entire picture. A good graphic designer will know how to add just enough graphics and colors to keep visitors on the page. You should also study the effects of colors on Internet visitors. For example, blue can cause visitors to linger longer on a page while red can cause them to take action. Incorporate these types of elements into your page and you’ll soon be able to increase your conversion rates. The Internet Has Gone Social: With the popularity of Facebook, Twitter and other social networks, the search engines and people all over the web are looking to those social networks to let them know what’s not. The search engines are giving higher rankings to sites and pages that are shared heavily on social networks like Twitter. And if that photo gets passed around on Facebook or Twitter, there’s a good chance it will dominate in Google’s image search. That +1 button next to rankings will also help those Internet marketing materials rise in the rankings. If you want more online marketing success, let the social networks and your gang of friends of followers help you get there. Organic Internet Marketing Expansion: A few years ago you could buy 1000 backlinks and you’d dominate in the SERPs. Today, those tactics no longer work. The search engines like Google have smartened up and they will put extra scrutiny on any Internet marketers who employ such tactics. Instead of buying links or taking any other easy ways out, it is far better to let your marketing presence expand slowly. Write and publish one article per day, write a few Facebook posts a week and keep the links and your various Internet marketing materials rank in a slow, organic manner. Sure, things always have the potential to go viral, but the search engines will know the difference between a video that’s shared by millions on Facebook and one that suddenly has thousands of links, all from foreign countries. Keep things organic and on the up-and-up and the search engines will reward you. Try to cheat and you could find all of your Internet marketing efforts in the toilet. Google has been known to de-rank or even sandbox completely any web presences that try to cheat the system. Don’t do it. Be Different With Free Content: If you want to surpass all of your competitors and you want to truly make it in the world of Internet marketing, you must set yourself apart. Study the competition, take what they’re doing correctly and expand on them to make your online marketing efforts even better. Give your visitors what they want and always go above and beyond. And whatever you do, always provide your visitors, prospects and customers with free, downloadable content. E-books, e-reports, videos and even free tickets to your upcoming webinar will go a long way towards solidifying your presence and your authority in those visitors’ minds. If you constantly give your audience what it wants and you always come through with free content, you’ll eventually be able to ‘recommend’ various paid products and services, raking in the big bucks while also leading an audience of loyal buyers who will always come to you whenever they need anything within your niche. That’s the key. You must become an authority figure in your niche if you hope for your audience to always come to you with their problems, and with their wallets open ready to hand you their hard-earned money. Be different with free content, and that’s exactly how your audience will approach you every time and with a frequency that will keep the income streams flowing in. 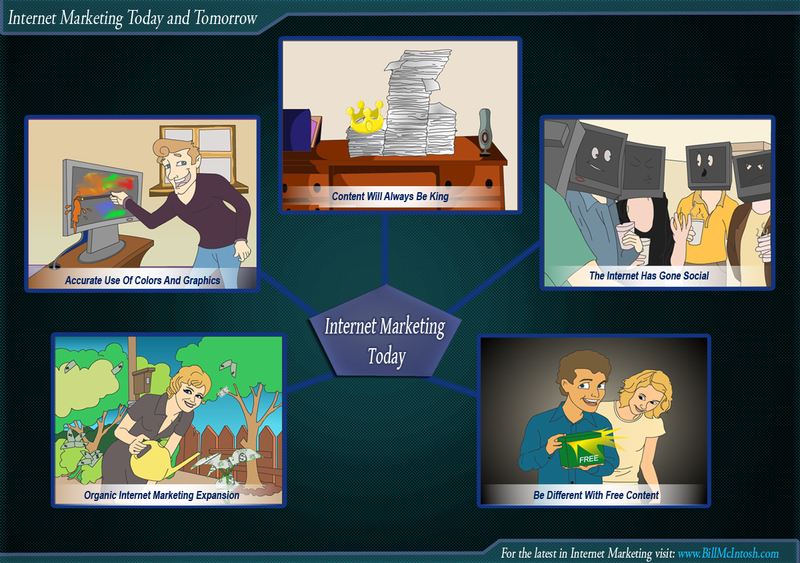 Internet marketing is constantly evolving. As long as you keep up with your knowledge of the search engines and of the buying and web surfing habits of your visitors, prospects and customers, and you keep one eye on the competition at all times so that you can remain ahead of the game, you will go far as an online marketing expert. Don’t rest on your laurels and make sure your content, colors and graphics and value as an Internet marketer always shine through. Do that and you will become the Internet marketing success story you’ve always wanted to become. This entry was posted in Online Marketing and tagged internet marketer, internet marketers, internet marketing, Internet marketing content, Internet marketing materialsexpert Internet marketer, Online Marketing, online marketing success, online presence by Bill. Bookmark the permalink.